There is no denying that I am a chocolate fan. In fact I can't understand why anyone wouldn't love chocolate. So you can imagine my excitement when a little box AntiOx chocolates and snack bars arrived on my doorstep. Not only was I receiving some free stuff but the free stuff just happened to be chocolate and to top it of chocolate that was deemed good for me. Total win win situation in my book. 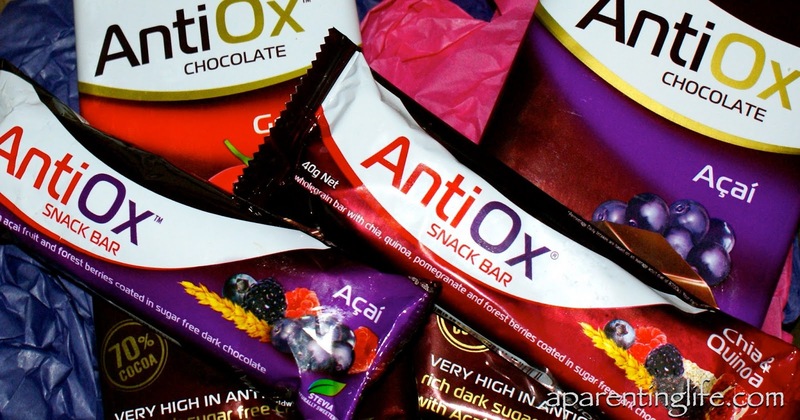 AntiOx snack bars and chocolate are high in antioxidants which makes them the perfect boost to your immunity levels as winter coughs and colds try to take hold. Oh and did I mention that on top of that they are actually quite yummy? The snack bars are chock full of wholegrains and come in three delicious flavours, Acai, Goji berry and Chia & Quinoa. All are coated with dark chocolate which, by the way just happens to be sugar free and 70% cocoa. Yep that's right sugar free. The chocolate is sweetened with Stevia which is a natural plant based sweetener. This part made me pretty excited because the whole I Quit Sugar thing is pretty popular at the moment so I thought it awesome that the AntiOx snack bars and chocolate were free from sugar as well as artificial colours and flavours. Perhaps proof that food photography is not exactly my calling? 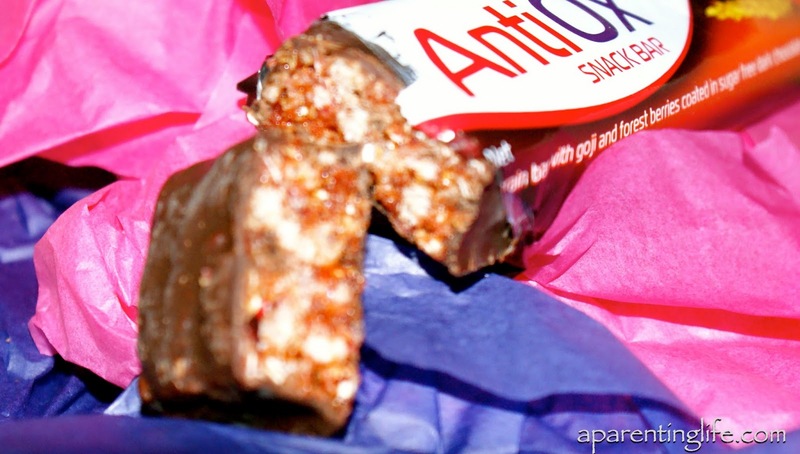 The AntiOx snack bars were a massive winner here. Especially the goji berry and acai ones. The amount of berries packed into each bar is super generous and made for gooey mouthful goodness with every bite. I found the chia & quinoa a little drier and not as yummy to my taste buds but certainly still edible and worth trying if you are a chia or quinoa fan. For me the chocolate block was not quite sweet enough and tasted more like dark chocolate than acai or goji berries. As much as I love chocolate I generally have that milky sweet stuff that is anything but good for you. Dark chocolate like this is a bit of an acquired taste I think, one that I am still in the process of acquiring. The upside to this of course meant that I could only have two or three squares at a time making the bar last longer and me not so much of a piggy eating it all in one sitting as I would with an ordinary chocolate block. But wait, the best bit is still to come. I have not one, but two prize packs to giveaway. AntixOx Snack Bars (RRP $2.49 for 40 gram bar) and AntiOx Chocolates (RRP $4.65 for 80 gram) are available in the health section of Woolworths, health food stores, pharmacies and convenience stores. You can also by online via the Vitality website. Yes it is a dark chocolate lovers dream come true! Yes that's right the antioxidants! Totally get your love of chocolate - I am hopeless as well - complete weakness of mine. Unfortunately I can't do chocolate and fruit together - weird but true! Good to know that there are some healthier sweet choices out there - do they happen to be gluten free by any chance? I usually have the will power to stay away from chocolate...but not lately! These sound absolutely delish, Rhi! I want to try it because it's CHOCOLATE!!!! I just picked up mine from the post office yesterday and I am in love with the chocolate! Being on this gestational diabetes diet I can't really have sweets and chocolates so the fact that there is such a small carb count per serve means that I can have a couple of squares without having to worry about throwing out my blood sugar levels. Score! Dave has eaten the bars, I couldn't keep him away from them! You had me at chocolate!! I'm desperately trying to break this hold sugar has on me, soooo not easy. I'd love to try this because I love chocolate and especially dark chocolate. Sounds so healthy, too!